Ever since the new SU catalogue came out, I’ve wanted to make a card using Concord Crush. Finally, for Cath and Steve’s wedding card, I found the time! Yeah! You see, purple is also one of Cath’s favourite colours. So, enter Destiny. 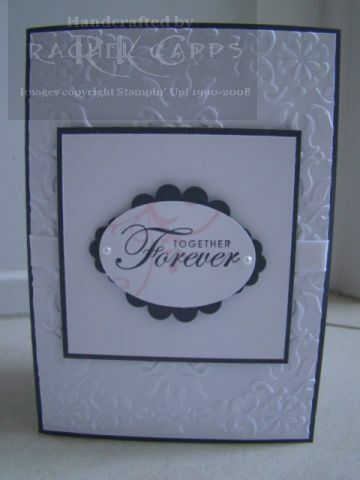 I made this card using Concord Crush and teamed it together with the Basic Grey and Whisper White. 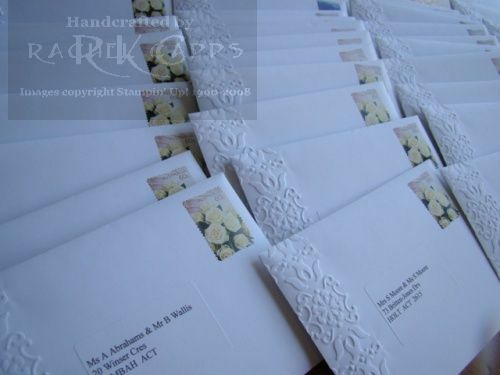 I also had to add Baroque Motifs, as I know how much Cath loves that stamp. Of course, who doesn’t love that stamp?!! lol. Anyway, you can also see that I added a touch of Vintage Wallpaper as well. Had to stick to my themes! The bride’s dress was made using the Vintage Wallpaper embossing folder with a few pearls at the bottom to make her truly elegant. For the tiara, I used the owl’s feet and added one of SU’s gorgeous teeny pearls. The groom’s waistcoat came from the Level 1 Hostess DSP pack and his bow tie (which I adore) came from two hearts from the Owl punch. A few pearl buttons finished him off. And how about the gorgeous sentiment? 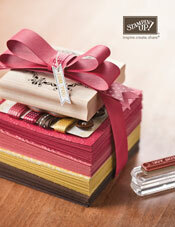 I love the stamp set, Well Scripted, which is available in the current Summer Mini Catalogue – only until 31 March 2011. Email me today to order it for yourself. Or why not order the Owl punch – at $33.95 (plus shipping) in Australia it’s an amazing punch to add to your collection. There is a little more to tell of Cath and Steve’s wedding, besides the waterfall of torrential rain that flooded their bridal table just as they were about to be seated or the fire alarm that interrupted the start of the speeches and couldn’t be turned off until the firemen arrived to flick the ‘off’ switch. All true. Trust Canberra to provide a delicious wedding memory. But, there are a couple more cards. 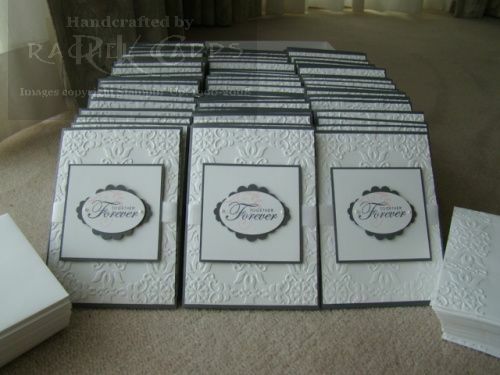 Today, I’ve posted the place name cards I made for all the guests. 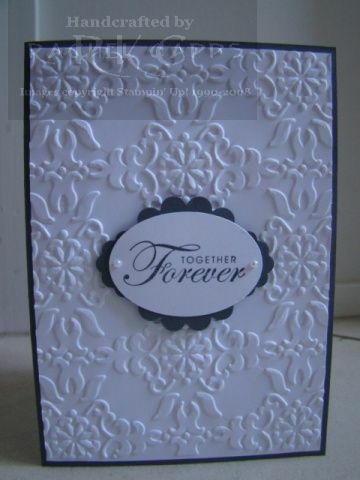 Again, I used Basic Grey cardstock and Whisper White embossed with the Vintage Wallpaper embossing folder, by now the signature of Cath and Steve’s wedding invitations. 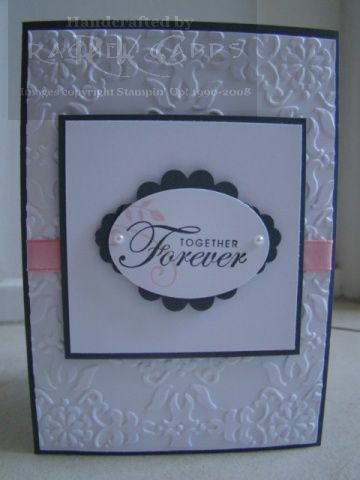 I added a pearl to the centre of the embossed design, and a touch of Pink Pirouette and Baroque Motifs to one corner. 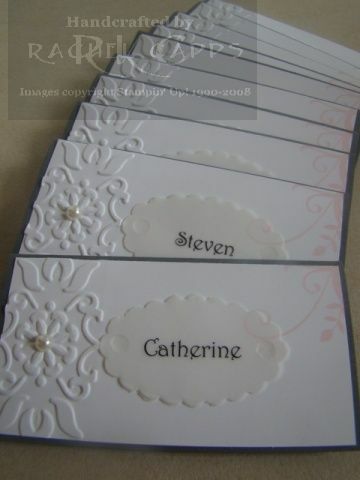 I printed all names on vellum paper and then punched them out using the Scallop Oval punch and I attached each name with Mini Glue dots – perfect because of their transparency. Well, the honeymoon is over and it’s back to work soon for the bridal couple, but I still have one more card from the wedding to show you. Check back tomorrow! 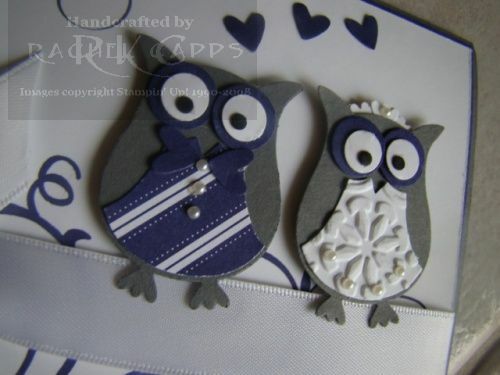 To make a wedding acceptance card is easy, right? 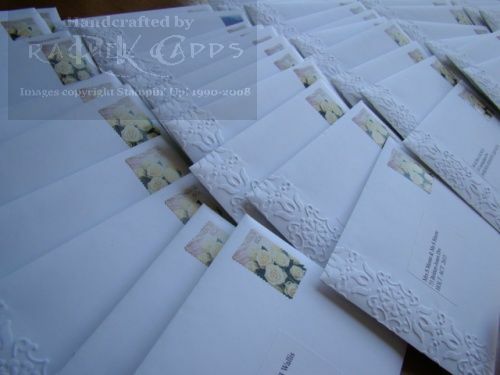 Well, when you’ve made the invitations, I found it a real challenge! In the end, I decided to take the wedding invitation idea one step further … and use one of my new favourite colour combos with a vintage look. So I used the colours Very Vanilla, Crumb Cake and Blushing Bride. I sponged Crumb Cake ink over the Vintage Wallpaper embossed image. 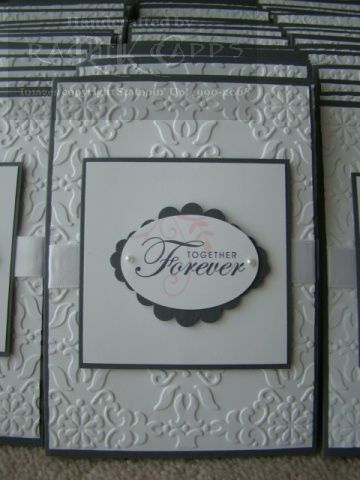 Then I stamped the Together Forever in Crumb Cake and kissed it just right using my Stamp-a-ma-jig with the flourish from Baroque Motifs with Blushing Bride ink. 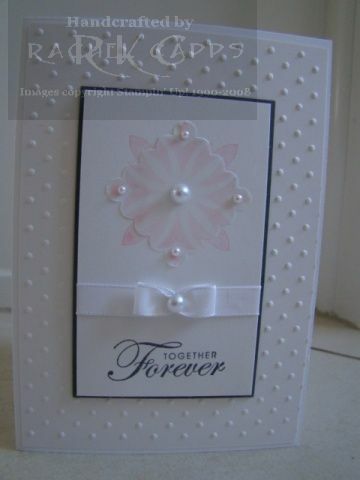 A couple of pearls, a bit of Very Vanilla textured cardstock and some non-SU lace and I had finished! 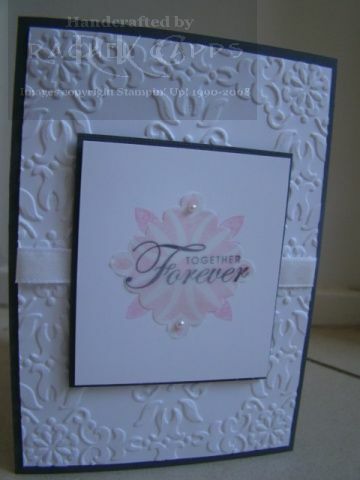 Of course, I embossed the Very Vanilla SU envelope with the Vintage Wallpaper embossing folder too. And now we draw near to the end of the creation stage of my sister’s wedding invitation journey. 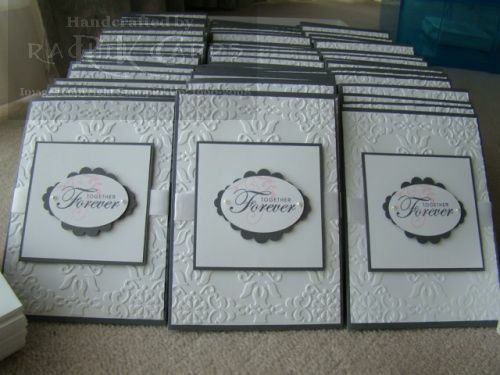 In the wee hours, while the house slept and my eyes began to sag, I made one last invitation that wasn’t anything like what Cath had asked for, except that it had a touch of the “Together Forever” and the colours – Basic Grey and Pretty in Pink. 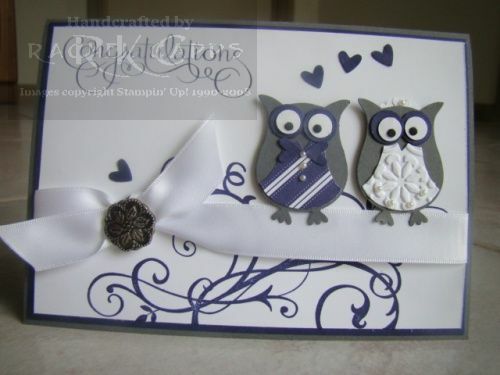 I had a new embossing folder from my latest Stampin’ Up! order and it called out to me, lol! 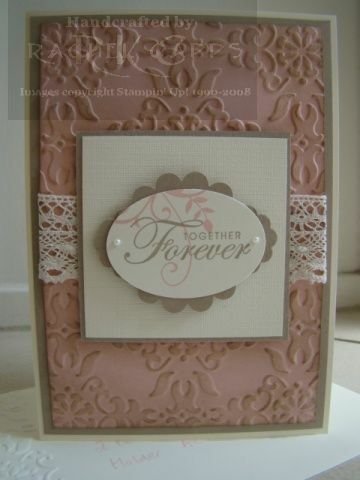 And so I used my Vintage Wallpaper embossing folder with my Big Shot and made this card. 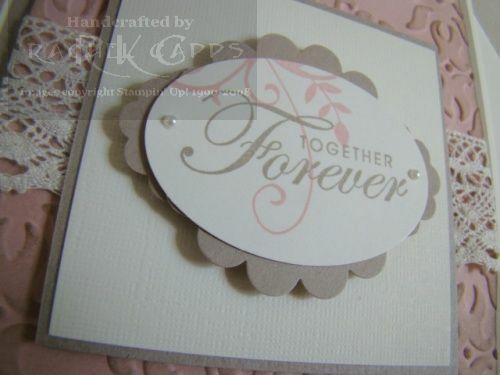 I kept the Baroque Motifs square stamped in Pretty in Pink, and I layered it with vellum punched with the scallop square punch and stamped with the faithful “Together Forever”. Of course, there were the pearls as well. And I used my last snippets of white taffeta ribbon, though you’ll have to trust me on that because you can’t see behind the middle panel, lol! 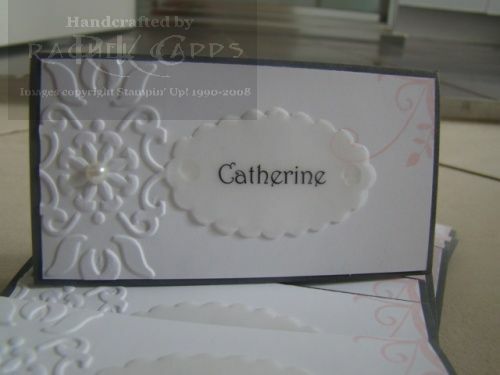 The first was the idea of the way I layered the scallop circle punch with the scallop oval punch. 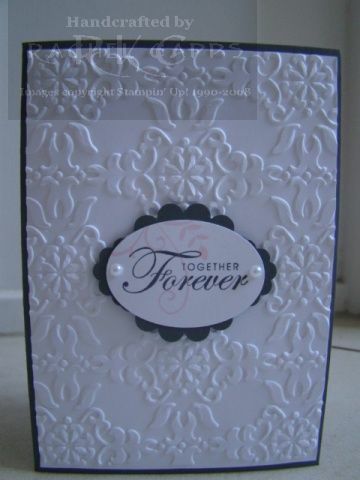 So I made a mock invitation with that layering and the Vintage Wallpaper embossing folder. Cath and Steve made their decision! But, you’ll have to check back tomorrow to see the end of wedding invitation’s journey and enjoy all its glory! Can you pick the design/colours they chose? 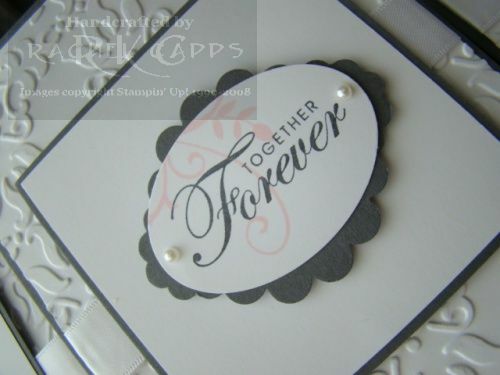 I kept the “Together Forever” from the stamp set Together Forever (retired) and I kept the square from Baroque Motifs, layering it with vellum and added a few more pearls. Love pearls! 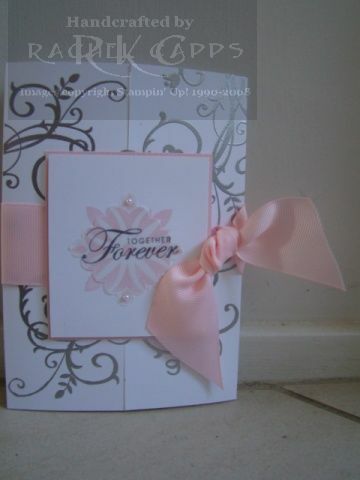 I had to get a little creative with the ribbon on this card, as I was on my last threads of white taffeta and needed to order more!! 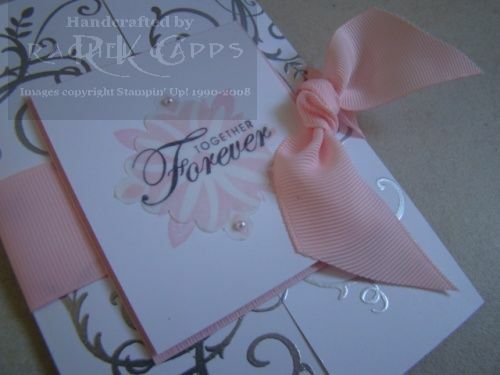 After the last invitation, Cath wanted to see what it would look like with a softer pink look. So I ditched the Basic Grey layer from the middle panel and replaced it with Pink Pirouette.